This past weekend, a Dutch nonprofit deployed a giant floating trap into the San Francisco Bay. The organization, called The Ocean Cleanup, says that the trap will scoop up plastic debris in the Pacific Ocean. If all goes well during initial tests, the organization could deploy the craft to the Great Pacific Garbage Patch, a vast field of debris floating between Hawaii and California. There, it could start to make a dent in the huge amount of garbage clogging up our oceans. Water currents power the device, drawing the two sides of the 600-meter-long (1,968-foot) craft into a U-shape. That corrals garbage into its center “like a giant Pac-Man” so that the trash can be returned to land for sorting and recycling. The Ocean Cleanup believes the boom could collect as much as 150,000 pounds of plastic during its first year in operation. While that’s just a fraction of the estimated 87,000 tons of garbage in the Great Pacific Garbage Patch, the nonprofit hopes that it could remove half the patch within five years — if it can deploy several dozen more booms. Experts have raised concerns, though, that the craft could trap marine wildlife like a giant fishing net. And the ocean environment can also be harsh and unpredictable. 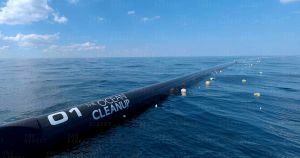 Until the boom is out in the Pacific (which The Ocean Cleanup expects will happen in mid-October, provided the tests go well), it’ll be unclear if it can withstand the high winds, corrosive salt water, and chaotic storms of the open sea.